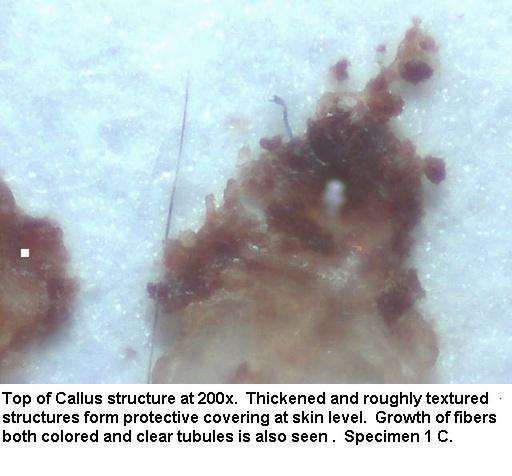 These photos contain views of the Morgellon's disease structure know as the Callus. 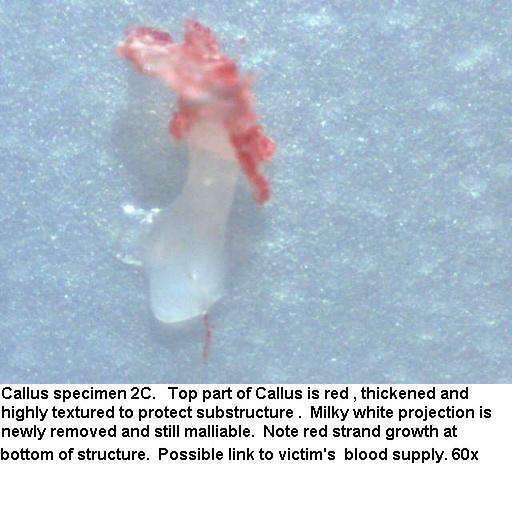 There are photos which show the nearly impermeable thickened, reddish-callused component that is visible from the surface of the skin. This callus protects the substructures and continues to grow as well. 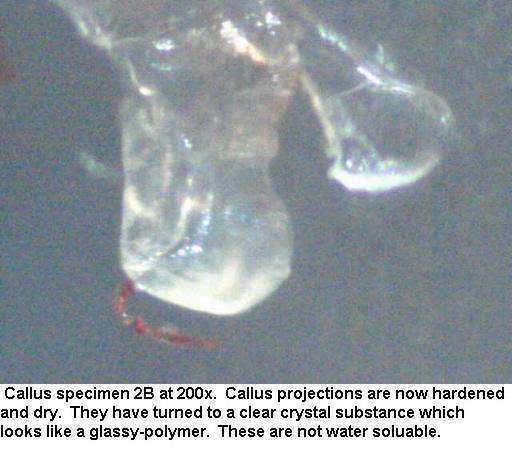 The photos also show other structures associated with that part of the Callus. 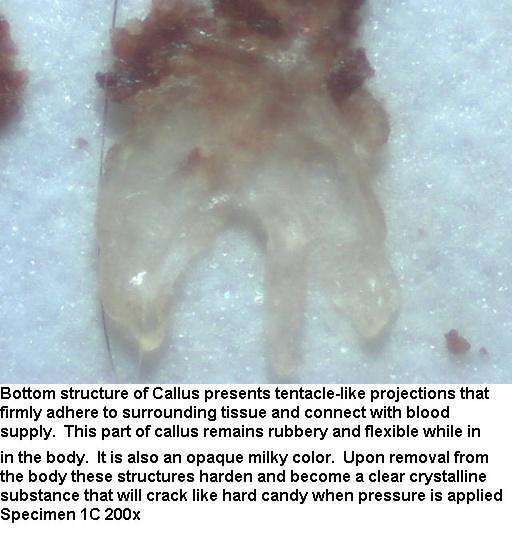 There are other photos which show the milky to transparent Callus-tentacles and the appurtenant structures associated with that subcutaneous portion of the Callus. There is a marked difference in the clarity and texture of the callus materials before and after removing them from the body. I have shown these differences as best I can. It is important to not that many of these structures are tightly grouped together forming a nearly intractable fortress to protect the feeding Callus structures beneath the skin. If even a single one is these structures is able to be removed from the Callus it is with great pain and great physical force. In the aftermath, there is profuse bleeding of an unusually thinned watery version of normal blood. It is as if some chemical compound in the tentacle is acting as a blood thinner. 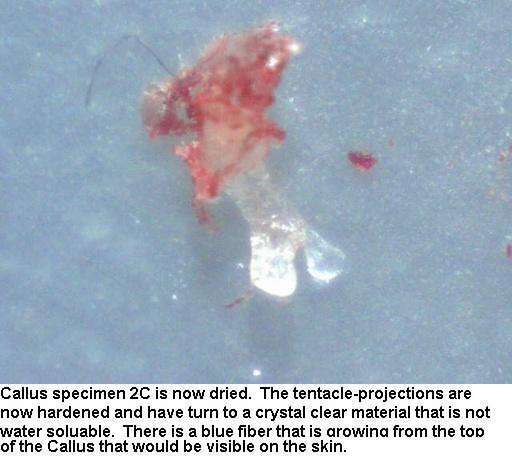 The removal of these callus particles leaves a deep hole in the skin which will generate and fill the void with a new tentacled protrusion is just hours.